Royal Philips (NYSE: PHG, AEX: PHIA) a global leader in health technology, today announced a collaboration with Japanese healthcare informatics company, Allm Inc. to jointly develop innovative connected healthcare solutions for acute care, mobile diagnostic solutions and home care. The collaboration will focus on developing and integrating Allm’s mobile communications solutions with Philips’ emergency care and resuscitation products. As part of the agreement, Philips has acquired a minority interest in Allm. As a global leader in emergency care and resuscitation, Philips supports professional caregivers and lay responders in quickly and effectively responding to emergencies wherever they occur. The company offers a wide range of innovative emergency care and resuscitation solutions, including automated external defibrillators (AEDs), advanced life support monitors, and data management solutions. Allm will complement and extend this offering with next-generation technologies and medical communications platforms for acute care, mobile diagnostic solutions & home care. Allm’s offering includes the smartphone application Fast-ED, which is designed to assist ambulance and emergency responders in the field to evaluate the stroke patient condition during emergency. Allm also offers MySOS, an app for first-aid support and personal health record. 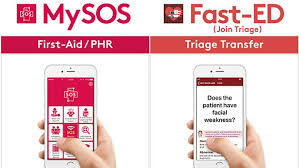 MySOS helps emergency medical services achieve higher survival rates, provides a community self-help platform, and reduces the cost of medical treatment. With more than EUR 1 billion in sales in 2017, Japan is Philips’ third largest market. Last year, Philips’ product and solutions that support people’s health, improved the lives of 38 million Japanese people.